These Stylus Pen Kits offer dual pen/stylus functionality in a slim, two tube design. You can easily take notes, draw or simply turn a page on your mobile device. The durable rubber tip protects the device's surface from scratches, smudges and allows you to type precisely and comfortably. 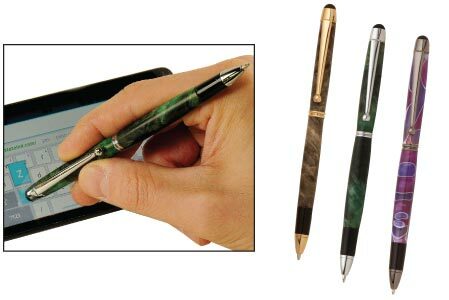 These Stylus Pens can be used on all capacitive touch screen devices like the iPhone™, iPad™, iPod Touch™ and similar touch screen devices. These pens are easy to make with straight cuts and 7mm tubes. They are turned on our pen mandrel with the bushings that come with the pen mandrel.